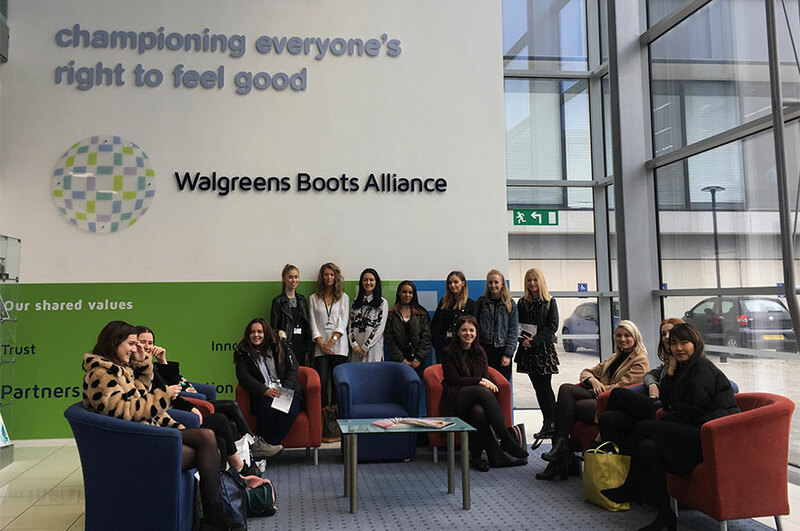 Students in their second year of the BA (Hons) Fashion Marketing and Branding course at NTU recently took part in a dynamic industry live project with Boots, the UK’s leading pharmacy-led health and beauty retailer. The project arose as part of the students’ second year module entitled Fashion Business Solutions. The module looks at simulating industry practice, and requires students to address an integrated marketing and branding challenge within a short and focused time frame. The challenge set by Boots related to innovation, specifically working on their key cosmetic brands. The brief was to identify a new product idea capable of broadening the brand’s appeal amongst existing buyers, and as a tool to bring current non-users into the Boots franchise. The project culminated in a Dragon's Den style presentation, whereby four student teams were shortlisted to present to senior stakeholder staff at the Boots head office in Beeston, Nottingham. This included the Innovation Ideation Manager, S&G Head of Brand Marketing and Digital, Trend Manager, Cosmetics Category Director and Category & Rapid Innovation Lead for Global Cosmetics. Following the presentations, a winning team was selected, and each member of the team awarded a placement at Boots. The overall winning team comprised of Julianna Brown, Emma Mitchell, Olivia Lang and Jace Tay. The senior stakeholder team at Boots remarked: "It was a really difficult decision. The winning team won by a small margin; we loved them all!". Following her placement earlier in the summer, Emma Mitchell said: "I worked with Boots for two weeks on a global consumer trends placement, working closely with the global consumer trends team to develop trend reports to enhance and impact the choices made by Boots. I was given the opportunity to develop a section of the Future of Retail trend report for Boots, which required a lot of research, analysis and reflection on how the company may look to expand in the future." She continued: "It was an amazing and eye-opening experience to see how the inside of such a big company works, and to gain an awareness of the vast range of job roles that are available. I gained a huge amount of knowledge of the beauty retail market and how brands need to work quickly to be at the forefront of consumer trends."